I'm a reader. From the time I was a barely talking and read the end of the movie to my parents, "The End, End, End," to today, I've always been a reader. I have a link in my sidebar to the books I'm currently reading but I've really been wanting to share more about them here. So here is the very first, "What I'm Reading," post. Late one night, I happened to finish up a book that I was reading, and was looking for something on my Kindle that would capture my interest. I found a book by Rysa Walker called Timebound and I was sold. It is about a teenage girl who's grandmother informs her that she is a time traveller and that the girl has inherited the ability. Nothing different than a ton of books with the same idea. But where this series really makes it's mark for me is that it takes you back in history and gives you an interesting look at different times. In Timebound's case, it was taking you back to the Chicago World's Fair and dealing with H. H. Holmes, America's first serial killer. 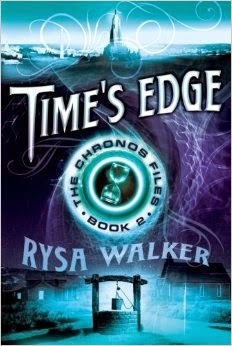 Time's Edge is book two in this series and was just released on Tuesday. If it tells you anything about what I thought about the first book, I pre-ordered this book and as soon as I received the notification from Amazon that Time's Edge was delivered to my Kindle, I started reading it. And sure enough, we start out traveling to the "grassy knoll." To stop her sadistic grandfather, Saul, and his band of time travelers from rewriting history, Kate must race to retrieve the CHRONOS keys before they fall into the Cyrists’ hands. If she jumps back in time and pulls the wrong key—one that might tip off the Cyrists to her strategy—her whole plan could come crashing down, jeopardizing the future of millions of innocent people. Kate’s only ally is Kiernan, who also carries the time-traveling gene. But their growing bond threatens everything Kate is trying to rebuild with Trey, her boyfriend who can’t remember the relationship she can’t forget. As evidence of Saul’s twisted mind builds, Kate’s missions become more complex, blurring the line between good and evil. Which of the people Saul plans to sacrifice in the past can she and Kiernan save without risking their ultimate goal—or their own lives? So far, Amazon readers have given Time's Edge a 5 Star rating. I'm not done yet, however, I am enjoying it thoroughly. If you enjoy this type of book, take my word for it and go get Timebound and Time's Edge. You won't be disappointed! !